For the past 2,000 years, most Christians have been wondering what the prophecies in the Book of Revelation really mean. Most people thought the visions on the scroll prophesied the disasters at the End Time, either pre-tribulation or post-tribulation. Unfortunately, or fortunately, all these past interpretations are incorrect. The reason people have such a misconception for a long time is that people tried to fit all the visions in the Book of Revelation into the "70th Week" in the prophecy of the "Seventy-Weeks" in the Book of Daniel (Daniel 9:24-27), but they might forget that in the Book of Daniel, the vision of the Four Beasts prophesied the rising of four kingdoms - Babylon, Medo-Persia, Macedon-Greece and the Roman Empire, which lasted over six hundred years. How could all the visions in the Book of Revelation, including the coming of the Four Riders, fit into a "Seven-year" period of the "End Time"? In fact, just like the vision of the four beasts in the Book of Daniel prophesied the historical events of the rising of four kingdoms, all these visions in the Book of Revelation prophesied the major historical events in the Christian history in the last two thousand years up to the New Millennium. And they were all prophesied in the chronological order as the Book of Chronicles in the Old Testament. “He rode out as a conqueror bent on conquest.” (Revelation 6:2) Roman Emperor Constantine the Great liberated Christians from persecution on 313 AD and Christianity later became the State Religion of the Roman Empire. Christianity took over the Roman Empire, which was once under the control of Satan, and never lost its power again. “A Rider on a Red Horse with a large sword” (Revelation 6:3-4) The Rising of Islam in the Middle East on 610 AD, “Preaching the Faith by the Sword”. After the Civil War, Americans were terrified by the destruction and casualties of the war and decided to honor God on their currency, “In God We Trust” (1864). The Kingdom of the New World has become the New Kingdom of God and the New Base of Christianity with the largest Christian population in the world. “The Flashes of lightning, rumblings, peals of thunder, an earthquake and a great hailstorm.” (Revelation 11:18-19) The Third Woe: The World War I & II and the Great Depression in the first half of the 20th century. The “Man Child” in Revelation 12:5, the “Second Child” prophesied in the Bible, was born under the reign of the “Red Dragon”, who would later come to the land of the "Great Eagle" (Revelation 12:14) and come out for the "Second Coming" in Revelation 19:11. The Antichrist Ideology and False Prophets phenomenon. The Anti-God Atheism attacked the Faith of God and Money-worshipping Materialism led people astray from God in the second half of 20th century. “The Harvest of the Earth” by the Son of Man (Rev. 14:14-20) The Spiritual Awakening of the “Man Child” in the year 2000. The "September 11" in 2001. The preparation of the Son of Man for the coming out for the “Second Coming”. – “Behold, I come like a thief! Blessed is he who stays awake and keeps his clothes with him.” (Revelation 16:15) AIDS, Water Pollution, Global Warming, Dust Storm & Haze, the Embargo on Iraq, which led to the Second Iraq War, ISIS & the “Battle of Armageddon”, and the Final “Fall of Babylon”. The Son of Man is already here during the time of God’s Wrath. – People of Faith will “reign with Christ for a thousand years”. (Revelation 20:6) The “Second Coming”: The “Second Child” in the Bible (Revelation 12:5) comes out to reveal the New Millennium Testament, the “Eternal Gospel” for all nations. but also the Book of Chronicle for the New Testament! Now, for the first time in 2,000 years, the mystery of the prophecies in the Book of Revelation was finally decoded by the “Man Child” prophesied in Revelation 12:5 with the testimony of the major historical events in the last 2000 years. Although there have been many people trying to decode the Book of Revelation in the past, none of them had the correct interpretation on the visions in the scroll starting from Chapter 6 of the Book of Revelation. As stated in Chapter 5 of the Book of Revelation, "No one in heaven or on earth or under the earth could open the scroll or look into it" except the Lamb. (Revelation 5:2-7) Therefore, only the Son of Man for the "Second Coming" has the authority to decode the 2,000-year mystery of the Book of Revelation since no one knows the prophecy in the Book of Revelation better than the ONE who was prophesied in the Book of Revelation. 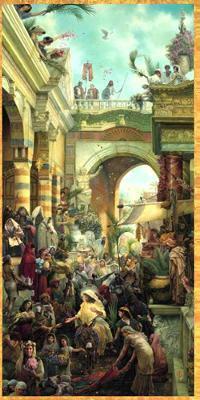 The Nature of Prophecies and the difference among major books of prophecies in the world. The Spiritual Baptism for the selected people to "reign with Christ a thousand years"
This is the must-learned information for all Christians to fully understand the true meaning of the prophecies in the Book of Revelation and learn how God interacted with His children throughout the human history. It is especially important for pastors, priests, ministers, Sunday School teachers, Christian leaders and scholars to come to the Training Camp as the Continue Education on the Word of God and then bring this New Revelation of God back to the people in their congregations. This is a rare opportunity for people to learn the true meaning of the prophecies in the Book of Revelation from the ONE who himself was part of the prophesies in the Book of Revelation. Due to the limited resource, the Son of Man cannot accommodate all the people who want to learn the truth of the prophecy directly from the ONE who was prophesied in the Book of Revelation. Therefore, this Symposium of the Book of Revelation is not open to the public, but only to the pastors, priests, ministers, Christian leaders and scholars who look for more deeper scriptural discussion and spiritual inspiration. 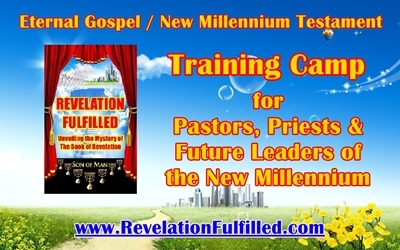 For those who cannot attend the Training Camp, the book, Revelation Fulfilled, is available for purchase and home study.